The Louis L. Goldstein Leadership Award is presented to recognize extraordinary excellence and leadership in state financial management and service to the association. 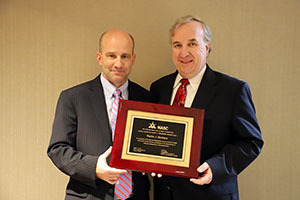 On Wednesday, March 13, Martin J. Benison (right above) was named as a recipient of the National Association of State Comptrollers’ (NASC) Louis L. Goldstein Leadership Award. This is NASC’s highest honor. The award was presented by President Alan Skelton (left), state accounting officer of Georgia, at the 2019 NASC Annual Conference, which was held in Atlanta. Benison has over 30 years of experience in the state government financial management world. He currently works for Accenture as director of state and local government. Previously he served as state comptroller of the commonwealth of Massachusetts for 16 years and as deputy comptroller for seven years. He represented state comptrollers and the broader community of the National Association of State Auditors, Comptrollers and Treasurers (NASACT) on the on the Governmental Accounting Standards Advisory Council (GASAC), serving as its chair for six years. The GASAC is the advisory body for the Governmental Accounting Standards Board (GASB), which provides direct input to the board on accounting standards. Benison is a past president of both NASC and NASACT. He received the NASACT President's Award in 2006, the NASC President's Award in 2007, and a NASACT Special Recognition Award in 2012. He is a former founding chair of the U.S. Treasury’s ASAP Customer Advisory Board and a former founding chair of the Association of Government Accountants’ Intergovernmental Partnership. Benison is a strong advocate for continued improvement and efficiency in government and has been a leader in many areas, including the due process for the development of accounting standards; business process development and design; e-commerce, automation and the smart use of technology; and working collaboratively to get things done. The Louis L. Goldstein Leadership Award is named after Louis L. Goldstein, former comptroller of Maryland and legend among government finance officials. It is presented to recognize extraordinary excellence and leadership in state financial management and service to the association. Benison is the sixth person to receive the award since its inception by NASC in 1994.